Zut alors! – For the first time in four years it’s wet and relatively cold for Rock En Seine, which, by the way, is not your usual music festival but a cross between the standard fare and a chic Parisian end-of-holiday party. Fashion conscious Parisians would of course rather die than look dowdy so they dress to impress even in the mud and rain. Great for the spectacle, but I did feel a bit out of place being the only person in thirty thousand sporting a fluorescent yellow waterproof jacket. So what of the music? Well I swerved Smith Westerns opening the Grande Scene (Main Stage), who were one of those bands that defy logic – why on earth would anyone pay to bring them over from the USA to play a festival in Europe when they have absolutely nothing to offer? Instead, I headed for Biffy Clyro opening the aptly named Scene de la Cascade and was not disappointed. They were terrific and their energy flowed off the stage and engulfed the entire crowd. I wondered two things – why were Biffy Clyro not headlining and how did they manage to hire Jose Mourinho as their extra live guitarist? Otherwise 45 minutes have rarely passed quicker and I was really disappointed to see them leave the stage. Then I went to check out radio-friendly Wolf Gang on the new-this-year Scene Pression (which I believe means ‘Beer Stage’ in English). This turned out to be a mistake as they were totally professional but not at all my cup of tea – Gum Takes Tooth would eat them for breakfast. Happily CSS lifted the spirits immediately, with a riotous performance that filled the Grande Scene. Full of anarchy, danceable hooks, random moves and punchy basslines, they really seemed to be back on top form and as an added bonus in excellent guitarist Ana Rezende they have the sexiest girl in Rock. Singer Lovefoxx was buzzing too, making several costume ‘changes’ which ended with her looking like a cross between a Luchera and Batman. Feeling good, I caught the opening of Kid Cudi who had if not the biggest then certainly the most enthusiastic crowd of the day. The sound balance wasn’t great at first but the crowd didn’t care – they went as wild as Parisians ever go, and some even waved US flags. Out of a rather British sense of loyalty I left the mayhem and moved to the Scene de L’Industrie for Big Audio Dynamite, the band formed by Mick Jones on the demise of The Clash, making a comeback after more than 20 years. I vaguely remember them being ahead of their time back in the eighties, but now they seemed totally dated and irrelevant – and all I could think about was poor Joe Strummer and how fantastic, and underappreciated, The Mescaleros were. Unfair comparison maybe but I’m not convinced BAD are worth reviving. The headliners were the Foo Fighters and the vast majority of the crowd was clearly there just for them. Dave Grohl was his customary personable self although he rambled on a bit more than usual, and everyone in the crowd seemed happy, if not ecstatic. Dave seems to fancy himself as a bit of a guitar hero these days so the set was littered with extended wigouts where he traded riffs with lead guitarist Chris Shiflett. That riff-off was particularly bold since it’s obvious that Chris is a very talented and, yes, better guitarist but more importantly I’m not sure I want a nine-minute version of 'Monkey Wrench' (and 'Stacked Actors', amongst others, was similarly bloated). Even so, they played long and hard in the American style and Grohl is evidently well on the way to being ‘The New Boss’. The Foo Fighters overran, so I could only catch a few songs from Death In Vegas who seem to have altered their approach considerably and from what I could see, since they played more or less in the dark, grown their hair – all of which made them seem like an electro version of psyche rock heroes, The Heads. They entertained without being compelling, in what was by then driving rain. 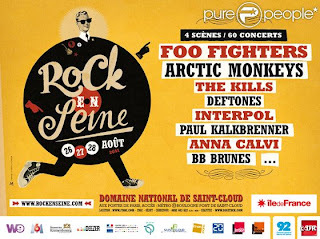 For more info on the festival, head to rockenseine.com.